In this video I finish the Qt Paint app I started in this video. So many topics are covered. We make menu bars, numerous dialog boxes, interact in numerous ways, allow for drawing, changing colors, changing line widths, printing, saving and opening new files. 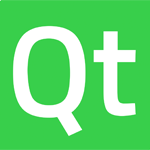 I hope this makes the original Qt example make more sense. The heavily commented code can be found below. If you like videos like this, consider donating $1, or simply turn off Ad Blocking software. Either allows me to continue making 100% free tutorials for all. If you get this error "Undefined symbols for architecture x86_64"